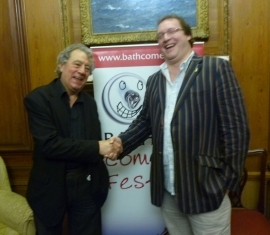 We are delighted to announce that three of Comedy’s best loved veterans have agreed to become Patrons of Bath Comedy Festival:Terry Jones – comedian, writer, actor, director, author and Python. Barry Cryer OBE – writer for many comedy legends and king of the one-liner. Arthur Smith – Comedian, broadcaster and famously grumpy old man. Other patrons of the Festival are former Natural Theatre Company supremo Ralph Oswick, Commissioner of Transport for London Sir Peter Hendy CBE and stalwart supporter Robert Brinkworth. Terry Jones said he was “delighted to become a Patron” because “Comedy is what makes the world a bearable place”. 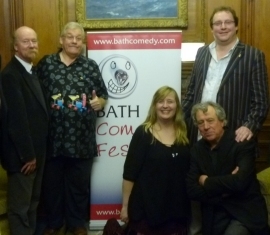 Bath Comedy Festival 2014 will be the sixth year of the festival and will build on the success of the first five years. The eagerly awaited return of award-winning German stand-up comedian Christian Schulte-Loh who brings his latest hit Edinburgh show to Bath. Christian is a highly skilled international stand-up act and regularly performs at the biggest clubs in the UK, Germany and all over Europe. Catch him here while you can!